The video below w is my first attempt at a live stream on YouTube. As you can imagine, there were dozens of hiccups (including me, not knowing if we were actually broadcasting). In the end, it work out fine. Like anything else, the first attempt may not be clean and polished but we learned a lot. Watch the video and let me know what you think. 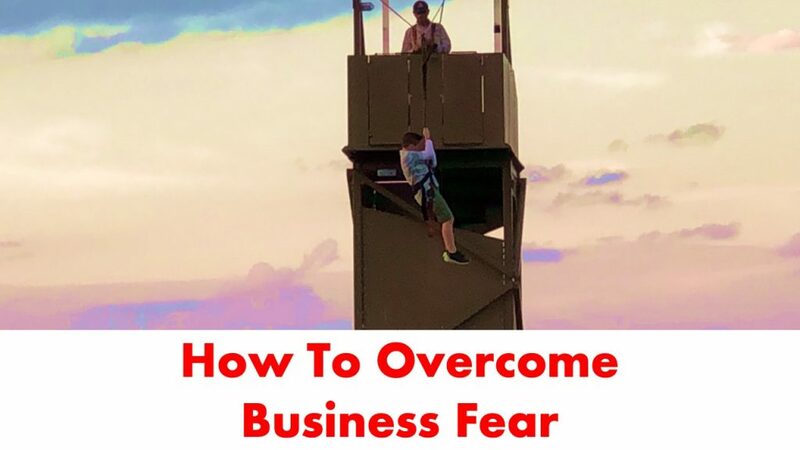 The thing that holds us back in sales and business is fear. Sometimes we are consciously aware of the fear but most often it exists on a subconscious level and it is keeping us from acting in our own best interest. My goal in doing his video was to generate awareness and help you think about how fear may be holding you back in sales and business. Here is the transcript from the video. Please note this is an unedited transcript taken directly from the video. It reads like spoken word because, well, it is spoke word. This is Dave Lorenzo Daily, and we’re live on YouTube for the first time. This is a live test and today we’re going to talk about the two types of fear. The two types of fear that might be holding you back. And whenever I talk about the two types of fear that might be holding you back, people say to me “Dave I get it, but I’m fearless. I’m not afraid of anything.” Well, subconsciously there are two types of fear that hold you back. The first type of fear that holds you back is the fear of failure, and that’s pretty common. Whenever I talk about the fear of failure with people they agree that the fear of failure is real, they agree that they experience a fear of failure, and they agree that it’s a problem. But the second type of fear is the one that people always struggle with, and that is the fear of success. The fear of success. Believe it or not, the fear of success is even bigger– it’s an even bigger problem than the fear of failure. So let’s talk about that. First, fear of failure. You don’t do something. You don’t sell because you’re afraid of rejection. You don’t take action because you’re afraid you won’t succeed. That’s the fear of failure and overcoming that fear is relatively simple. You just numb yourself to the fear. You throw yourself into it. It’s fun, the kids love to do it. My son was afraid, and we’ve conditioned him to push himself through the things that scare him, and he did it and after he did it the first time, he did it over and over again. He wasn’t afraid anymore. What he did was, he fought through the fear and after the first time he conditioned himself not to be afraid anymore. It’s the same thing in business. When you are facing some sort of fear, if you condition yourself to– you experience that over and over again and you condition yourself so that that experience is no longer new. You’re not afraid of it anymore. I work with a lot of people who have a fear of public speaking, and they want to overcome it. So what we do is we take them to a room full of ten people. Ten people who they know, and they work on a speech that’s maybe 5, 10 minutes long, and they give that speech to the ten people that they know, and they feel comfortable doing it. Then we find another group of 20 people, or 25 people, or 30 people, some of whom they know, some of whom are strangers and they give that same speech that they’ve practiced over and over again in front of the group of 20, 25, 30 people. And after they’ve practiced that speech in front of the group of 20, 25, 30 people, they feel a little bit better about it. Then we get them in front of a group of 80, 90, or 100 people. They go in front of the group of 80, 90, or 100 people, and they deliver that same speech. The speech that they’ve practiced over and over again, and they realize that nothing bad has happened to them. They’ve become desensitized to it, and they’re able to face the fear down and they may still experience it, but they realize that nothing bad is going to happen so they go ahead and do it and they get through it. That’s how you condition yourself to overcoming fear. Exposure helps condition you to overcoming fear. Years ago, I had a very bad fear of heights. I still am not great with high places, but years ago I had a very bad fear of heights. So I went to see a therapist, and I said to the therapist, “Listen, I can’t go through life with this fear anymore”, at the time I was in my 30s. I said, “I’m 32 years old. I want to break free of this fear. What do I need to do?” What the therapist did was took me to high places, and we hung out and looked over the edge in high places. We walked up flights of steps that were wide open, which were particularly problematic for me in the past. We went to all different kinds of places where I had to be up high, and I exposed myself to it, and at first I was petrified, but then the more I did it, the more comfortable I became because the more normal it seemed. The same is true for you in business. The first time you take out a line of credit, in your business, to let’s say hire someone or to invest in some assets that are going to provide a return for your business. That’s terrifying. It’s absolutely terrifying. But when you do it and you pay that line of credit back, you realize that it’s just a common occurrence, many people do it and you can do it and be successful as well. Your fear of failure can be overcome through conditioning. You can condition yourself to overcome your fear of failure by exposing yourself, from a business perspective, to those things that scare you. In sales if you’re worried about calling people on the phone and asking them for money, call them on the phone and demonstrate the value you can provide. Have a comfortable conversation and then just say, “Would you like some help?” and when they say yes I would like some help what would that look like, you explain to them that you get paid for providing help to people. Or you explain to them that your products help people, and you get paid for giving them a product that will be helpful to them. The more you do it, the more you become conditioned to it, the easier it becomes. And what you’ll remember is the success that you have, and you won’t necessarily remember the times that you failed. And this is true when you do this with frequency. To overcome fear what you need to do is you need to expose yourself to the thing that you’re afraid of, and you need to expose yourself to the thing that you’re afraid of with frequency. That’s how you overcome the fear of failure, and then when you realize that number one, the failure wasn’t the end of the world, and number two, the failure was productive if you learn from it, and then number three, that the more frequently you undertake this, the less you’ll remember the failure and the more you’ll be happy and excited about your success. You’ll find that the fear will eventually subside, it may even go away altogether. Fear of success is something completely different. Fear of success is something that many people experience on a psychological basis and they don’t realize it. So here’s what fear of success looks like. You, psychologically, are concerned with what your friends are going to think if you make more money. You, psychologically, are concerned that you’re going to have to move into different levels of business, and you’re not going to be able to fulfill the expectations that the customers have at the higher level. Here is an example: When I first went from working with small businesses to working with big businesses, I realized that I could charge more money, but when I started charging more money I started thinking to myself, what if I don’t meet the expectations that people have? I’m now charging $150,000, I’m now charging $200,000, what if I don’t meet peoples’ expectations when I charge 150 or $200,000? I’m going to be a failure, people are going to ask for their money back, it’s going to be terrible, I don’t know what I’m going to do. None of that ever happened, but that fear of success, that fear of stepping up was so great that it prevented me for a long time from going after big businesses. Now, take that even a step further, I started making more money, we are able to send our kids to a better school, and we’re networking with parents who are more affluent, what if those people don’t accept me? What about the people I am currently friends with, no one would want to be friends with me because I make more money now. And you, psychologically, start to sabotage yourself, and it prevents you from being successful. The fear of success may even be more powerful than the fear of failure because the fear of success is sneaky, the fear of success sneaks up on you, it doesn’t bite you right in the face. It sneaks up on you over the long term. To overcome fear of success you meet with somebody you trust, so in my case, my wife. You can meet with someone who’s close to you, and you can discuss what will happen when you’re successful. Discuss what success will look like, discuss what you’re going to do when you achieve this success. After you discuss what you’re going to do when you achieve this success, you start to condition yourself as if it’s already happened. The other thing that’s great to do is you close your eyes, and you just visualize yourself being successful. Visualize yourself in that place where you’re already successful. Visualize yourself hanging out with different types of people. Visualize yourself in different environments. Visualize yourself with different types of people. Visualize yourself having new experiences that you can only have as a result of being successful. And once that happens in your mind, you’ll perceive it as real because your mind can’t tell the difference between what you’ve imagined and what’s real. Once that happens in your mind, it makes it much easier, you’ve conditioned yourself, to achieve it in reality. Another helpful activity is to surround yourself with pictures, photographs, or drawings of the things that you will have and the places you’ll go, and the things that you’ll do when you’re successful. They used to call these vision boards. You put them up on poster board all around your office or around your home, in your bedroom, in your bathroom, so you see these things over and over again and you become conditioned to seeing them, so the fear of success is taken away by the same thing that we used to take away the fear of failure, and that’s repeated exposure. Those are the two fears, the fear of success and the fear of failure. This is a really good experiment for me to go live when I explain these two things. I am looking forward to doing more of these. This has been a test, it’s been impromptu, I don’t think anyone was even watching me do this live, and when I edit it I’m going to cut out all that crap that happened in the beginning, hopefully that nobody saw, so that it’s a learning experience for me. Eventually, in a few weeks we’re going to do a show where I’m going to come to you live every day at a specific time, but until then you can come back right here wherever you’re watching this right now, come back right here, and look for the occasional test cause we fly without a net here. I do these tests occasionally. I have no fear of failure. You can see at the beginning of this video that we made a couple of mistakes. I don’t know if you saw the battery pop out of the mic pack, but we have no fear of failure here. We fail publicly and live in front of everyone, so thanks for joining me. I look forward to doing this again, I think it’s a great forum. Join me right here wherever you saw this, this has been broadcast across different forms of media. So I look forward to seeing you again right here very soon. Until next time, I’m Dave Lorenzo and this has been The Dave Lorenzo Daily Show live for the first time ever!